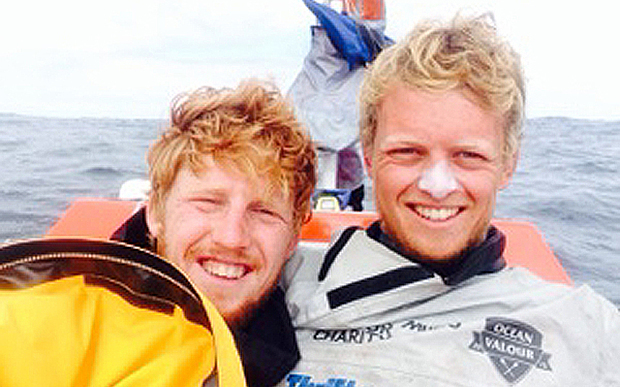 On May 3rd 2015, Frazer-Nash's Lawrence Walters and his friend, Tom Rainey - Team Ocean Valour - set out from Manhattan, New York to row 3,800 miles unsupported across the North Atlantic Ocean to honour the memory of Tom's Father Luke, who died from a brain tumour and raise £250,000 for the Brain Tumour Charity. On Tuesday 4 August, after exactly 93 days at sea the team stepped off their ocean rowing vessel Yves and into the Guinness Book of World Records - as the youngest team to row the North Atlantic . This is their second World Record, as the distance covered between 14:00 30 May and 14:00 31 May GMT was an astounding 112.5 nautical miles - nine more than the previous record set in 2014. Their arrival was met with cheers and applause from the welcoming party, which included their friends and families. Some of Lawrence 's Bristol-based colleagues were on a boat as part of the welcoming flotilla, which also included kayaks from Plymouth University, where Tom completed his degree. Colleagues throughout Frazer-Nash have supported the team by donating through the company's Care and Share Scheme - a Give As You Earn programme that is operated by the Charities Aid Foundation (CAF) and includes contribution matching by Frazer-Nash. The final total has yet to be calculated - but his colleagues and the company have helped raise a significant amount towards the team's goal. "I am delighted for Lawrence, Tom and all those who have supported Ocean Valour. What a tremendous achievement. All of Lawrence 's colleagues from Frazer-Nash's 650-strong UK and Australian team are incredibly proud of what he and Tom have achieved. We are looking forward to having him back in the office, safe and sound after his mammoth challenge. Congratulations!"